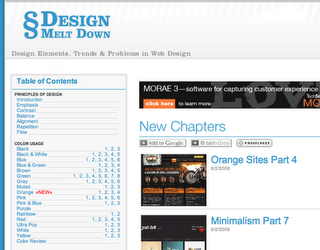 Design Meltdown has long been a good site for trend spotting and plotting when it comes to the web tubes. There is a long list of site examples and techniques based on even the smallest site details, from site color to visual style. Give it spin, see what you can dig up. A great tool to have in your arsenal when starting a site or any design project.